Sturt Football Club is pleased to announce the signings of Rory Taggert and Sam Dunn. 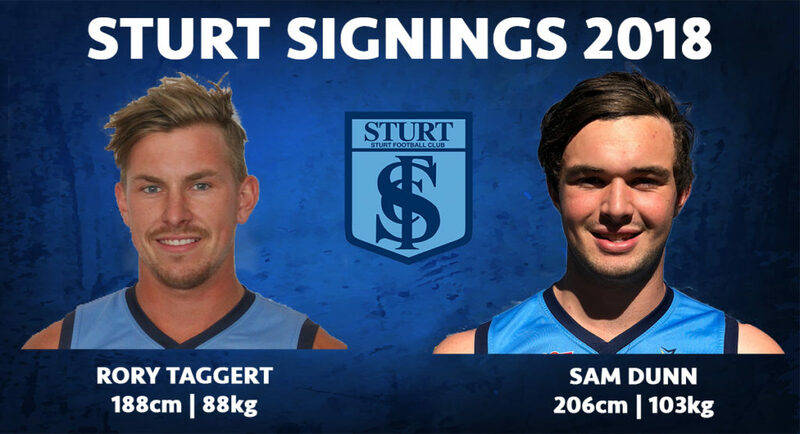 Taggert is a strongly built midfielder who previously played with Sturt in season 2014 and 2015. He returns to Unley Oval after two seasons at North Warnambool in the Hampden League in Country Victoria where he had a player/coach role. Previous to this Taggert was drafted by Melbourne FC with pick 36 in the 2011 National Draft and spent 2 years on the Demons list. Dunn a ruckman from Tanunda played underage football for Central District FC before returning to Tanunda FC last season. He was a member of the State U18 squad in 2016. The end of the 2017 Season saw the retirements of dual premiership players Scott McMahon and Kory Beard along with an outstanding 6 players being drafted to the AFL. Retaining 18 of our 21 Premiership players puts the Club in a great position to start season 2018. Long term-injured player John Greenslade has started pre season and is eager to cement his spot in the League side. Premiership Under 18 and Reserve players are also pushing for senior selection. There is going to be some interesting selection nights for the coaching staff next season. Our depth is the best in years. Rory and Sam will add further depth to our reigning Premiership side and we welcome them to the Team! Stay tuned for more news over the next few weeks. Good work, now how about a target up forward, is brett eddy looking for a new home?